Notes: This is the 3rd State of the 2nd edition from an earlier state of 1563 (Betz # 8.3 showing copperplate erasure of the "Apud eundem Camotium ad signum Pyramidis" from within text box cartouche below the date. This erasure of Comocio's name may indicate a re-printing date after Camocio's death in 1575 ) (The 1st edtion was 1562 and it remains uncertain to what extent Forlani copied or collaborated with Gastaldi drawing from his earlier maps including Gastaldi's large map on the wall of the Doge Palace in 1549); copper engraving on 2 sheets; source: separately published map from an assembed style of Lafreri composite atlas; Nicolaus Stopius is the dedicatee with uncertain contributions to the production or notations of the map. [framed]; In 1546, the Venetian Council of Ten issued an order that a map of Africa be prepared for the "Sala del Scude" of the Palazzo Ducale (Doge's Palace) and painted on the wall. This task was entrusted to the most prominent Italian cartographer of the sixteenth century, Giacomo Gastaldi. More than two-hundred years later, in the 1760s, Gastaldi's map of Africa was painted over and the original lost to posterity. 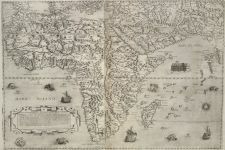 It was preserved, however, in an 8 sheet engraved map and in the folio form of this printed version, finely engraved and published by Paolo Forlani in 1562 and a this edition of 1566. Gastaldi was the principal cartographer of the Venetian school of mapmaking and one of the foremost geographers of the sixteenth century. A native of the Piedmont region, Gastaldi was official Cosmographer to the Venetian Republic. This map is characterized by crisp engraving, attention to detail and an elegant linear aesthetic.